Bishopston (Llandeilo Ferwallt in Welsh) is probably the largest village on the Gower Peninsula. It is situated on the South East Gower Coast. The old part of the village lies at the head of Bishopston Valley. It is fortuitously placed close enough to Swansea to be able to pop to the shops or into Mumbles, but has the added advantage of being remote enough to claim three beaches of its own, Caswell, Brandy Cove and Pwlldu Bay. The photo to the right shows Pwlldu, with the village of Bishopston nestling at the top of the cliffs. Bishopston’s beaches are popular with locals and visitors alike, although they are very different from each other. Caswell attracts many surfers, but is popular with young families too, with safe bathing and lifeguards during the summer season. There are many tales of the smuggling that took place at Brandy Cove, a tiny cove to the West of Caswell, that leads up to a wooded valley (hence its name). Pwlldu, which literally translated from Welsh means “Black Pool” lies to the West of Brandy Cove. In its former life, it was a thriving community quarrying limestone. There are only two buildings remaining; which were the pubs and are now private residences, but ruins of further cottages can be found in the Bishopston Valley. Pwlldu has the air of unfathomed mystery and romance, that ladies I’m sure you could associate with many a good novel! 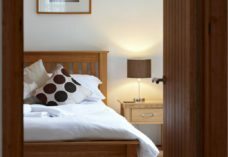 Three fully equipped farm cottages sleeping 4 to 6 people. No smoking inside. No pets. Ample parking. Bed linen and towels available to hire. Easy access to Mumbles, Swansea and the Gower beaches. Short breaks. Whole house available March – October . B&B available Nov – March. Please view the area map below to get your bearings and familiarise yourself with the roads. The table shows the approximate travelling times by car, from Bishopston, to the various villages.